Ten Chu is a composer, musicologist public figure, a member of Composer’s Union of Kazakhstan, professor, doctor of philology and tenuar professor of conservatoire at Chang Yang University (Seoul, Republic of Korea) honored figure of culture of Republic of Kazakhstan, was born on 25th of December 1923 in South Korea. 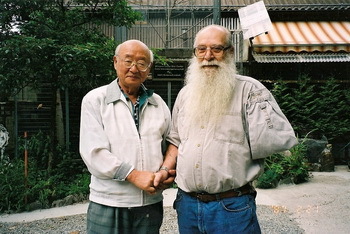 He studied composition at the Nihon Daigaku University (Tokyo). Learned Russian language at the Foreign languages Institute in Pyongyang (North Korea). Graduated from Moscow conservatoire on the class of composition guided by Professor An. Alexandrov. His compositions are widely performed in Kazakhstan and abroad. In 1990 he was awarded with a medal of Republic of Kazakhstan “For Labor Achievement” in his work. In 2001 he was awarded by President of the Republic of Korea with the Folk Order “Tong Beck Tjang” “Camilia”. 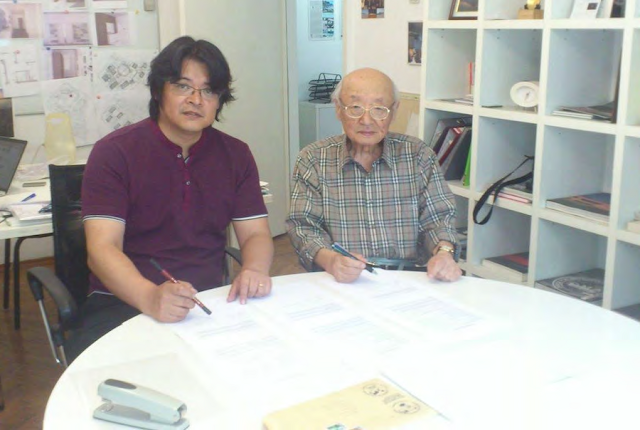 For his great contribution into public and cultural development of the Republic of Korea he was awarded with KBS prize of Korean aboard Diaspora (Seoul, 2004). He is a co-chairman of International political organization “The Front of salvation and struggle for democratic union of Korea”. From his early days he was interested in meditation, astronomy, searching for constant laws of living. He got acquainted with Billy’s studies from 1990 and is one of his ardent admirers & advocates. A passive member of the FIGU society. Personal acquaintance with “Billy” E.A. 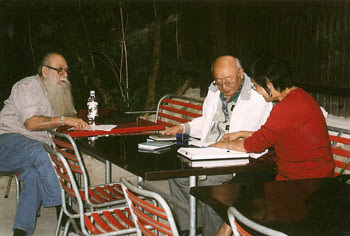 Meier got place in 2004 and served as a stimulus for spreading the studies of Truth, the creation of Eurasian Institute of research in Billilogy, and the library at the Institute, the creation of Public Fund of “Billy” E.A. Meier and the University of “Billy” E.A. Meier in perspective. On 13 July 2013 we were informed by Yuji Imayo from E.I.R.B (Eurasian Institute of Research in Billilogy) in Almaty / Kazakhstan that Professor Ten Chu died the same day, after he had (see photo above), signed a contract the day before, which he received from Billy, for the publication of the book OM was granted to the Russian-speaking world. After he had corresponded for several years with Billy, Prof. Ten Chu visited the SSSC first time in 2004, fulfilling a lifelong dream for him later. In 2010, he was for the second and last time in Hinterschmidrüti. With his Eurasian Institute of research in Billilogy, he supported our mission through the translation of several books of Billy into the Russian language.